FAQs - Local & National Electrician, Electrical Contractor, Electrician In - Stirling, Alloa, Falkirk, Glasgow, Edinburgh, Scotland. We have a selection of Frequently Asked Questions (FAQs) below, which we hope you will find useful. Our trained job booking team will be happy to discuss your requirements. Please phone on 01786 813916 or book or enquire online. Who Do You Carry Out Work For? We carry out electrical and security system work for domestic, commercial and industrial customers. This can range from householders, landlords, shops, letting/estate agents, housing associations, high street stores including commercial and industrial companies with premises throughout Scotland. What Type Of Work Do You Carry Out? We carry out all electrical and security system installation, maintenance, inspection and testing work. This can range from the installation of extra sockets and lights to rewires and new builds. We undertake small jobs as well as large contract work - we have electricians and a pricing structure to suit all electrical work. 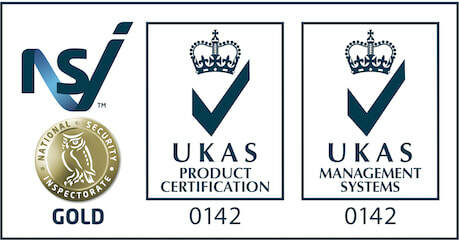 We are accredited to NSI GOLD level for installing Intruder Alarm, CCTV and Access Control systems. We can provide a maintenance service for your property. Our inspection and testing service includes fixed wiring testing of the electrics within properties and appliances can be inspected and tested through our PAT Testing service. See the menu links under 'Installations', 'Inspection & Testing' and 'Maintenance & Faults' for a full list of our services. Stirling Electrical Services offices are based in Fallin just a few miles south east of the city of Stirling, but all our electrical services are available to customers throughout Scotland. Our electricians regularly work in villages, towns and cities throughout Scotland including the islands. Closer to home we have a large customer base throughout the Stirling, Alloa and Falkirk areas as well as in Perth, Edinburgh and Glasgow. Distance within Scotland is no object to us and our job booking team look forward to discussing your requirements. Our job booking team will discuss your particular requirements and will advise on pricing. We are happy on most occasions to provide estimates or quotations free of charge. We pride ourselves on providing a 'Professional Efficient Service' and we strive to offer competitive rates whilst providing a quality customer-focused service from the minute you call our company through to job completion. On most occassions Yes we are happy to provide you with a free estimate or quotation. This may be provided verbally when you call us, or in writing and we may have to visit your premises depending on the type of work required. Depending on the location of your premises and the type of job to be done a charge may apply on some occassions - if this is the case then you will be notified by our job booking team when you contact us. We receive many calls requesting an estimate for fault finding jobs. We are unable to provide a fixed cost for fault finding work due to the work required to investigate the fault. Our job booking team may suggest that we attend for a short period of time to investigate your fault which will be chargeable and once the agreed time limit is up we will update the client with our findings. We will endeavour to repair the fault within the agreed time limit. We find this is the fairest approach for fault finding work. Our job booking team will be happy to discuss your requirements, see our full contact details. You can also book or enquire online. How Quickly Can You Attend A Job? Our job booking team will be happy to discuss your requirements and depending on the nature of the job, will either schedule a suitable time, or for emergencies arrange for an electrician to attend as soon as we can. We try and give specific time slots in which we aim to arrive and our job booking team will always keep you informed. We are nearly always on time but if delayed our job booking team will keep you informed. Our vehicles are fitted with SAT NAV tracking devices so our office team always know where each van is located in order to schedule in the closest vehicle to you to attend. We try give specific time slots in which we aim to arrive and our job booking team will always keep you informed. We are nearly always on time but if delayed our job booking team will keep you informed. Our vehicles are fitted with SAT NAV tracking devices so our office team always know where each van is located and will be in touch with you on the day of your job if they can see that we are being delayed. Who Is Sent To My Premises To Carry Out The Work? A qualified electrician (and on occasions apprentices) will arrive on time to undertake electrical work. They will possess the required skills and experience and will be employees (not sub-contractors) of Stirling Electrical Services Ltd. We take extra care to screen all applicants prior to employment so you can rest assured that they are proven professionals. We were established in October 1996 and have been carrying out electrical work throughout Scotland since. Yes all our electricians are trained and qualified to current electrical wiring regulations - BS7671:2011. Most of our electricians have also undergone an electrical apprenticeship before becoming qualified. We also employ apprentices who are employed under SECTT training scheme and SJIB guidelines. Our electricians regularly attend approved training courses to enhance their skills - these include the standard electrical regulations, and we also arrange for electricians to attend courses specialising in fire alarms, emergency lighting, security alarms, inspection and testing, local building authority warrants and PAT Testing. Do You Have Any Accreditation? Please visit our accreditation page for full details of our accreditation. Yes we have £5,000,000 Public Liability Insurance and £10,000,000 Employers Liability Insurance. Yes as an approved member of SELECT we operate with a Code of Practice and Guarantee Scheme which aims to ensure the best possible relationship between our company and our customers. The Code and Scheme covers all electrotechnical work undertaken by us in the disciplines in which we have been satisfactorily assessed by SELECT. You can pay for your invoice in a number of ways. By cheque, BACS, PayPal, cash or credit/debit cards. Please visit our how to pay invoice page for full details. Can I Give Feedback On Your Service? We actively seek customer feedback. If we have recently carried out work for you, we would be grateful for any feedback on the service we provided. You can give us feedback online. Where Can I Find Your Premises? You can find our office address and map on our full contact details page.